Lindsay Calhoon Bring hails from Georgia, where she spent her youth sitting in front of a television set. She didn’t like the story handed to her, so she spent her days creating new ones. Her love of theater sent her to Valdosta State University, where she wrote and produced original plays for the student led Immediate Theatre Project. 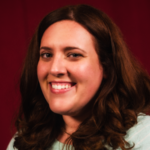 There, a playwriting class steered her west in pursuit of screenwriting, in hopes that one day she’d impart the same wisdom she received from the likes of Buffy, Uncle Phil, and Kevin Arnold. Lindsay co-wrote the comic book series Penguins vs Possums, wrote for VH1’s web series Planet Sebastian, and has worked on a Who’s Who of cancelled television shows. She likely sold you a spa package on the streets of Los Angeles in 2008 and she definitely made you coffee. Lindsay currently writes for Chilling Adventures of Sabrina (Netflix).